I have been working on a “perpetual” menu that is kind of like a perpetual calendar. It can be used yearly instead of having to write a menu plan every week or month. It makes things so much easier. Of course we won’t stay on this menu every single day. When holidays and other activities come up then we will plan something different but for the most part we will be sticking to the plan. It makes things so much easier. Since there will be only 2 of us to cook for I will be freezing a lot of dishes to have ready when I need them. You can make your own perpetual menu by asking your family what their favorite meals are and then go from there. Notice that I wrote a X12 in the right hand corner of the card. This indicates how many times that recipe or menu will be used in a year’s time. 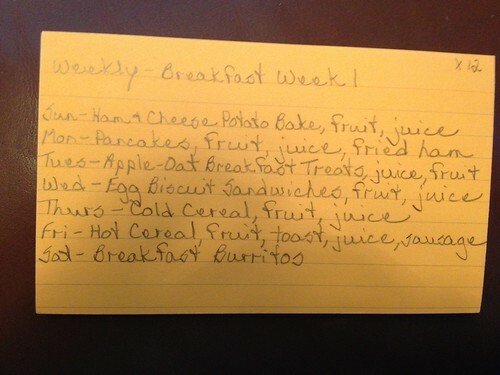 There are 4 Weekly Breakfast Menus. One card for each week in a month. Each month uses the same 4 cards. I have included in this post all of the Breakfast Menus and recipes. In the next post I will post the Hot Weather Menu and then the Cold Weather Menu. I tried to use recipes that the family liked and were easy to cook, using make ahead and freezable dishes whenever possible. In a large bowl, combine soup, sour cream, melted butter, cheese, pepper, and onion powder. Stir in cubed ham and hash brown potatoes. Pour into Ziploc freezer bag or aluminum pan, cover with plastic wrap and aluminum foil. May freeze Ritz crackers and butter in a separate bag. Thaw completely. If in a Ziploc bag, pour into 9″x13″ pan. Bake @ 350 degrees for 35 min. Crumble Ritz crackers and melt butter…mix together and sprinkle over top casserole and bake for another 10-15 min (until bubbly and golden). Your total baking time will be 45-55 min depending on how thawed it was going in and how quickly it bubbles and heats throughout…I am finding some of the meals take a little longer to bake than the directions say (including my own frozen and thawed meal). May take out smaller portions to cook. Be sure to reduce cooking time. For example, I would use a small cast iron skillet to cook for just hubby and I. Keep the rest frozen for another day. Be sure to add the ingredients in the order listed. Start by adding the 1-3/4 cups milk, 2 eggs, and 1/4 cup of shortening. Next, add the 2 cups flour, 2-1/2 teaspoons baking powder and 1 teaspoon of salt. If your blender has a hard time blending thicker ingredients, try adding the flour in steps. For example, blend in the first cup until a smooth texture is reached, then add the remaining flour and dry ingredients and blend on high. Continue blending on high until a smooth texture is reached and you can see a good flow in the blender letting you know all of the ingredients are blended evenly. You may find that for whatever reason your batter is still a bit too thick. You can add a bit of milk at a time and continue to blend until a desired consistency is reached. It should be fairly easy to pour but not runny. On a slightly buttered or greased preheated griddle or fry pan, pour out a quarter cup or so of the batter. Watch for the batter to begin to bubble and brown one side, then turn the pancake over and brown the opposite side. This should make about 15-18 4 inch pancakes. This can be made ahead of time and frozen. Just take out as many pancakes as needed and heat up in the microwave. I also cook the ham or bacon ahead of time and freeze it. As you are cooking the pancakes fresh blueberries can be sprinkled on top. Yum! In a bowl, cream butter and brown sugar. Add the eggs and vanilla. Combine dry ingredients; add to the creamed mixture and mix well. Drop by 1/4 cupfuls 6 in. apart onto ungreased baking sheets. Flatten into 3-in. circles. Make a slight indentation in the center of each; top with a rounded tablespoonful of pie filling. Bake at 350° for 16-20 minutes or until edges are lightly browned. Cool for 5 minutes; remove to wire racks to cool completely. Yield: 10 servings. Freeze. Take out as many needed night before and let thaw in the refrigerator. Preheat your oven to 350 degrees. Grease the muffin tin. Crack one egg into each muffin cup. Salt and pepper each egg a little bit. Put biscuits on baking sheet if using biscuits. Bake the eggs 10-15 minutes. Bake the biscuits as directed. After biscuits and eggs are done, it is time to assemble the sandwiches. Cut biscuits or English muffins in half. Place some grated cheese and egg inside each biscuit. May also add a slice of Canadian bacon or a slice of cooked sausage. Place all your sandwiches on a baking sheet and put in freezer for an hour. Then wrap each sandwich in plastic wrap and put all sandwiches in a freezer bag. This will keep for 2 weeks. To reheat wrap sandwich in a paper towel (this is important because it absorbs extra moisture so sandwich won’t be soggy). And microwave for 1 minute or bake 20-25 minutes at 300 degrees. My family doesn’t like veggies but sautéed onions, green peppers, etc can be added to this. Cook sausage in a skillet, breaking it up as it cooks. Drain off grease then crack 12 eggs into it. Stir it around until the eggs are cooked. Fill warmed flour tortillas with the egg/ sausage mixture. Top with some grated cheese and roll up. Place all the burritos on a baking sheet and place in freezer for one hour. After one hour take out of the freezer and wrap each burrito in foil or plastic wrap and place in a freezer bag, Freeze. To serve take out as many burritos as you need unwrap and then wrap in paper towel. Microwave for about a minute or 2 depending on size of burrito. May also bake foil wrapped burritos in a 350 degree oven for about 10-15 minutes. Serve with salsa. Place bread in a greased 13-in. x 9-in. baking dish. In a large bowl, beat eggs, milk, vanilla and cinnamon; pour over the bread. Cover and refrigerate overnight. Remove from the refrigerator 30 minutes before baking. Meanwhile, in a bowl, cream butter, brown sugar and syrup until smooth; spread over bread. Sprinkle with nuts. Bake, uncovered, at 350° for 1 hour or until golden brown. Yield: 6-8 servings. This is similar to the pancake recipe. Mix all together in blender. Don’t over beat. Pour into waffle iron. Combine margarine and sugar in the bowl of an electric mixer; beat until light and fluffy, about 1 minute. Add eggs and beat for 30 seconds; add applesauce and beat just to mix. In another bowl, stir together flour, salt, cinnamon and baking soda; add to mixer and beat to form batter. Add oats, apples, cranberries and walnuts; combine by hand. Line cookie sheet with parchment paper or coat with cooking spray. Drop batter by heaping tablespoons 1 inch apart. Bake until cookies are lightly browned and firm, about 13 to 15 minutes. In a bowl, combine flour, sugar, baking soda and cinnamon. Add the carrots, apricots, sunflower kernels, coconut and chocolate chips. Stir in the banana. Beat eggs, oil and vanilla; stir into carrot mixture just until moistened. Fill greased or paper-lined muffin cups two-thirds full. Bake at 375° for 18-22 minutes or until a toothpick comes out clean. Cool for 5 minutes; remove from pans to wire racks. Freeze. To serve: take out number of muffins needed and let thaw overnight on kitchen counter, covered. Yield: 1-1/2 dozen. In a saucepan, combine milk and cheese. Cook over low heat until smooth, stirring constantly. Stir in ham and peas. Melt butter in large skillet, add eggs. Cook over medium heat until set. Add cheese and stir gently. Spoon into an ungreased shallow 2 quart baking dish. Separate biscuits and cut each in half so that you have half circles. Place with cut side down around the outer edge of dish. Bake uncovered at 375 degrees for 15-20 minutes or until biscuits are golden. Can make this the night before but don’t bake. Cover and refrigerate. Combine brown sugar, butter and cinnamon; spread evenly in a greased 15x10x1 pan. Set aside. Combine eggs and milk in a shallow pan; place bread in pan and soak for 5 minutes, turning once. Place over brown sugar mixture. Bake, uncovered, at 350 degrees or until golden brown. Serve brown sugar side up; dust with confectioners sugar. Make this night before and refrigerate until ready to bake. Cook and crumble sausage; drain. In a bowl combine bis quick, cheese; stir in sausage. Add water and toss with a fork until moistened. The mixture will be dry. Shape into 1 1/2 inch balls. Place 2 inches apart on ungreased baking sheet. Bake at 400 degrees for 12-15 minutes or until puffed and golden. Cool on wire racks. (4 dozen). Freezes well. To reheat- 400 degree oven for 7-9 minutes. Do not thaw. Combine flour, sugar, baking powder salt and pepper. Beat eggs and milk; stir into dry ingredients. Stir in ham, cheese, bacon a d onion. Fill well greased muffin cups 3/4 full. Bake at 350 degrees for 45 minutes or until toothpick inserted near center comes out clean. Cool for 10 minutes before removing to a wire rack. (20 cups). Make day ahead and zap in microwave. Freeze leftovers. Combine all ingredients, pour into greased shallow 3 quart or 13x9x2 pan. Bake uncovered at 350 degrees for 45 minutes or until knife comes out clean. Let stand 5 minutes before serving. This can be prepared, covered and refrigerated overnight. Remove from refrigerator 30 minutes before baking. Combine flour, sugar, baking powder, and salt. Combine egg, milk, oil, vanilla and chips; add to dry ingredients and mix well. Pour batter by 1/4 cup onto greased griddle. Stir batter before pouring each batch. Top with strawberry, banana and syrup. Makes 8 servings. Can mix up batter the night before and refrigerate. Place bananas and next 7 ingredients in blender. Blend in cereal. Stir in raisins. Coat muffin cups with spray, fill 1/2 full. Bake 400 degrees for 16-18 minutes. Makes 1 dozen muffins. Can make ahead and freeze. Posted on August 3, 2013 August 26, 2013 by cookingwithpizazzPosted in Freezable, Menus, Monthly MenuTagged Breakfast, Food, Menus, Recipes. Previous Previous post: I Love Potatoes!! !